Wednesday, September 20, 2017 was a day that changed Puerto Rico forever. Hurricane Maria tore across the island, destroying almost everything in her path. Puerto Rico’s infrastructure was damaged beyond recognition. Homes, roads, power, and clean water, gone. To make matters worse, a combination of politics, aging and poorly maintained equipment, and rough terrain combined to make rebuilding the electric grid a monumental task, that will likely take years to complete. As a result, any of those who remained on the island have been without the basics like running water, lights, refrigeration, and a way to cool the houses that still stand. Fuel shortages rendered generators useless, or too expensive to run. An interesting phenomenon was pointed out to us by many people who called us from the island, when they were eventually able to drive to mountain tops to get cell phone reception. Most homes that had solar panels installed on their roofs still have both the roof and the panels. Some of the panels may have been damaged by flying debris, but the majority of the roof mounted solar systems were spared. The irony of this is that without the electric grid, their grid-tied solar systems were useless. Grid-tied solar systems are required to shut down when the grid goes down, to protect the line workers repairing the lines. Homeowners are calling us to help add a battery bank to their existing solar systems to make them useful without the grid. Enter AC Coupling. Diagram of the flow of electricity in an AC Coupling for battery backup. See altE’s YouTube video for details. 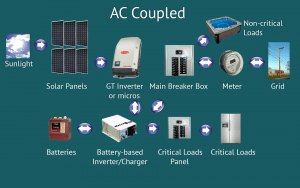 AC Coupling is a way to add battery backup to your existing grid-tied solar system. You are able to trick your grid-tied inverter into thinking the grid is still up by adding a new battery based inverter/charger and a battery bank between the grid and your existing solar system. The AC output of the new inverter/charger will send clean pure sinewave AC power to your critical loads panel. Your grid tied inverter will see the power from the inverter/charger, and think that it is from the grid, so it will continue to work. Meanwhile, the new inverter/charger will disconnect itself from the grid, creating an isolated off-grid system. This complies with electrical code and keeps the lineworkers safe as they try to repair the lines. To learn more about the details of adding battery backup to grid-tied solar, watch our video. altE Store has taken some of the complications out of adding battery backup with AC Coupling, by putting together a battery backup kit with most of the components you will need. 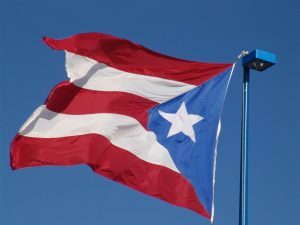 The kits have been shipped to a warehouse in Guaynabo, Puerto Rico, near San Juan, for customers to either pick up in person, or have shipped to their location on island. Because everything is already on the island, you won’t have to deal with delays, high shipping costs, or importation details. It is intended to add battery backup to your existing solar system, so it does not include solar panels or solar panel mounting. 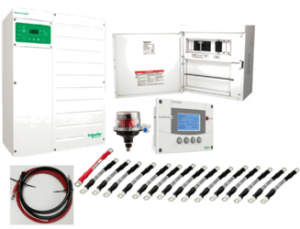 The kit includes a Schneider XW+6848 hybrid inverter/charger, System Control Panel to configure and monitor it, a breaker box with the inverter’s DC and AC breakers, lightning arrestor, and enough battery cables for the 16 batteries recommended below. You will also need to buy a new 200A AC breaker box and 2-pole 40A AC breaker to install as a critical loads panel. They are very common and can be found at any hardware store. By adding a critical loads panel, you are able to power only the most important items, like your refrigerator, and not waste energy on non-critical items. All the major components needed for a hybrid grid-tied battery backup solar system are included in this kit. It can run with or without the grid, so it can be used now as off-grid, and once the grid comes back and be used to sell and buy power to and from the grid. 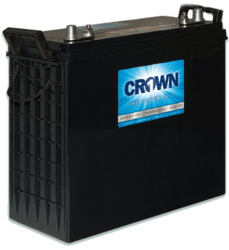 We also have a AGM Crown deep cycle batteries . We recommend buying a full pallet of 16 for a total of 780Ah 48V, 37.4kWh battery bank. Due to the way that AC Coupled systems, like our battery backup kits, charge the batteries, a large battery bank is needed to prevent overcharging and damaging the battery bank. We do not recommend using a smaller bank than this. For long life, batteries like to be charged at a certain rate. If they are charged with too much current, they can become damaged by trying to charge too fast. If they are charged with too little current, the battery bank will not be fully charged and will suffer an early death from sulfation, where crystals form inside the battery. The fastest recommended charge rate for an AGM battery is around C/6. That means a charging current of about 1/6 of the amp hour of the battery bank. 780Ah / 6 =130A, which is right around what the inverter will be charging at with a 6000W solar array. If individual batteries are also needed for smaller systems, we have also shipped 12V 230Ah AGM Crown batteries that can be bought in any quantity. It can be tricky for us to make generalizations about what you would be able to power with this battery backup, because there are so many unknowns regarding your particular house and existing solar system. What we can tell you is based on the battery bank size. If you install the pallet of 37.4kWh batteries, you would only be able to use half of the stored energy at the most. This is considered 50% depth of discharge (DoD). Using less than half will increase the life of the battery bank. The inverter is capable of outputting up to 6800W continuously, with a surge of up to 12,000W for 30 seconds. If you need more than 6800W, 2 kits are required to double the watts available. Talk to us about your needs. So let’s say you have about 15kWh of stored energy that you can use each day. This is assuming you have at least 5kW of solar to recharge it each day. You need to create a loads list to see what your specific needs are, but here is are some examples. An energy efficient refrigerator will use about 1kWh a day. If you have an old fridge, it could use twice that much. A 3 ton mini-split air conditioner may use about 10kWh a day, while an equivalent size inefficient air conditioner may use 50% more at 15kWh a day. 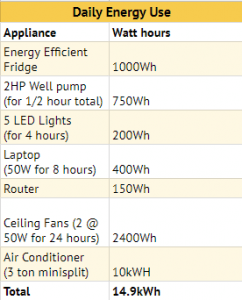 As you can see, there are a lot of differences in power use, so your best bet is to so your best bet is to calculate your loads for your house. See the loads list we created on the left for what a home could power with this system. You can see that a 3 ton mini-split air conditioner is possible to run with this backup kit. Actual usage may vary based on the size of your house and air conditioner, but it is possible to run it at least some of the day. A large window unit air conditioner uses about 1500W, so multiple units can be run. Check the label on your appliances, they should tell you the watts they draw. What If You Don’t Have Any Solar Yet? As the need continues to grow for solar systems on island, we have dramatically increased the solar equipment we are now stocking in Guaynabo. In addition to the AC Coupled kits and batteries, we now have solar panels, rail-less concrete roof racking, railed roof racking, pre-wired off-grid inverters, all-in-one lithium battery backup systems, charge controllers, battery cables, and so much more. If you need something we don’t have there now, it only takes about a week for us to ship small items from our Massachusetts warehouse. Contact us to see what the best option is for you. The battery backup kits and batteries shipped to Puerto Rico the end of December and will be available in January 2018 for pickup or home delivery. If you have any questions, please contact us at the altE Store. 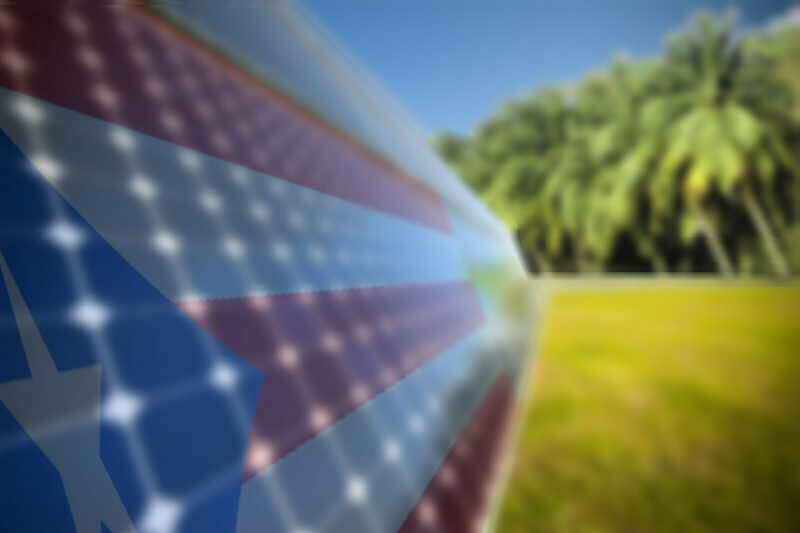 We are here to help, and together we can help make Puerto Rico a shining example of the resilience, community independence and sustainability that solar power can bring. 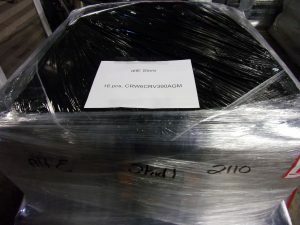 Pallet of 16 Crown 390Ah 6V deep cycle batteries ready to go to Puerto Rico. 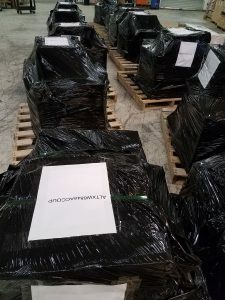 Multiple pallets of battery backup kits headed to San Juan that can be used for AC coupling to existing solar grid tie systems or off-grid solar power.